The fireplace is a very important element in a room. With the right fireplace surround, a fireplace can become the centerpiece, more breathtaking than any artwork. There are many ways a beautiful fireplace surround can enhance the appearance of a room. Below are some tips to help in your search for the perfect fireplace surround. 1. Take accurate measurements of your fireplace openingSpecify the width, height and any details that might limit the mantel or hearth. 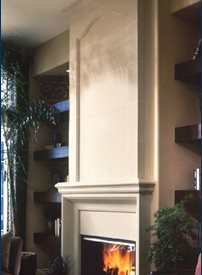 For homes with space constraints or with uniquely shaped fireplace openings, pre-cast fireplace surrounds may be the best choice as it can be cut to fit, while other materials may not. 2. Be descriptive and detailedGive the contractor as much detail about what you are looking for in terms of shape, style and cost, so the vcontractor can provide you with the best service possible. 3. Ask good questionsQuality suppliers should be able to answer the following questions. Do you have experience working with a variety of "firebox styles"? What does your design selection consist of? Do you design and customize? Do you warranty or guarantee your products? Can you advise in the selection of an appropriate fireplace box? Content Courtesy of Sierra Concrete Design, Inc.